Spectral CT offers new possibilities. A research team in New Zealand led by Anthony Butler, MB, ChB, PhD, a radiologist at the University of Otago, Christchurch in New Zealand, has designed a new scanner that can capture 3D color X-rays of the human body. Its developers believe that this tool, which utilizes a Medipix3 chip, will someday assist in diagnosing cancers and blood diseases without invasive surgery. "It functions much like a camera and allows us to see the details of various tissues, such as bones, fats, water, and cartilage," Butler says. "It's a whole new X-ray experience and a big upgrade from black-and-white film." He explains that the scanner counts subatomic particles as they meet pixels when its electronic shutter is open, allowing it to generate high-resolution images of soft tissues, including minute disease markers. "The scanner matches individual X-ray photon wavelengths to specific materials and then assigns a corresponding color to the scanned objects," Butler says. "The tool then translates the data into a three-dimensional image." Gary E. Friedlaender, MD, an orthopedic surgeon at Yale University, says by linking the slices together in this way, one can literally visualize the three dimensions and manipulate them, and, while not new, MARS Bioimaging has done it in a way that is highly effective. Butler's father, Phil, is a medical and particle physicist who was on the New Zealand team at CERN, the European Organization for Nuclear Research, evaluating detectors for a large hadron collider. Butler explains that CERN in the '70s and '80s was looking at new ways to measure particles for its experiments, and the researchers knew that the older system was not going to offer enough functionality in the modern computer world, so they developed direct conversion detectors. These direct conversion detectors, also called photon counting detectors, take a particle such as an X-ray photon and turn it into an electrical current. The detectors then analyze the current and provide a signal, allowing researchers to analyze a particle beam in any way they want. "I had just finished my radiology residency, and I actually also just finished my PhD," Butler says. "My father said, 'Why don't you look at the stuff at CERN and see if it's really going to be useful?'" So, starting in 2005, Butler and his team began working with that technology to build CT scanners and, in 2007, released their first one—a four-energy photon counting spectral CT scanner. "We always had in the back of our mind that it was one thing to build a CT scanner. It was really important to understand how it could be used," Butler says, "We brought in a team of about 50 people in New Zealand; a third of them worked for MARS Bioimaging Ltd, and the other two-thirds worked at the university's physics department." At the time, the team was looking at ex vivo specimens—surgical specimens and animal models of disease in mice, rabbits, rats, etc, and spent the next four years translating its findings to human imaging. "The first human photon counting CT was actually done in Israel in 2008. That proved that you could scale the technology up in terms of speed, but it wasn't really practical and they gave up shortly after," Butler says. "What we've done is, by focusing on the small animal models, we've really had a good understanding of how this sort of technology can help in things like heart disease or cardiovascular disease and how it can be used to personalize medicine in cancer and seeing the targeted nanoparticles and nanoprobes that are coming out of the pharmaceutical industry." Additionally, the team looked at bone health, imaging the microstructure of the bone and then simultaneously providing information about the mineralization of the bone in a way that can nearly eliminate metal artifacts. "We built up through this sort of preclinical research a body of knowledge about how spectral imaging is going to impact radiology," Butler says. "We've now got to the point of showing that we can produce the same sort of image quality in a body part that we can produce in animals." Butler says the scanner utilizes a microchip that records incoming photons from an X-ray beam one photon at a time. As the photon strikes the detector, it records the energy and bends it into one of eight possible configurations. Radiologists can select the configuration before the scan, and they can choose up to eight configurations simultaneously. "It works with incredibly high spatial resolution for a CT, so we have pixel sizes of 110 microns, whereas most CTs have pixel sizes of several hundred microns that are 300 to 500 or even bigger," he says. "That gives us very, very high-resolution data. It's got very good energy resolution, so one of the issues of that sort of technology is the better your energy resolution, the better your sensitivity and specificity." The scanner operates like an ordinary CT; pictures are taken from all directions, and an algebraic reconstruction technique converts the projection energy prediction data into a 3D volume showing the partial densities of water, fat, and calcium as well as contrast agents like gold, gadolinium, iodine, and hafnium. In terms of diagnoses, Friedlaender says the new technique will be helpful with anatomical abnormalities, abnormal tissues, or tumors and will aid in the ability to monitor changes and better treat them. "That's because you can see them better and you can visualize how to get to them, either with a needle for biopsy or a surgical approach to get rid of them," he says. "I think this is an evolution, not a revolution. We have wonderful CT and MRI imaging that gives great detail, but this is a clear evolution in terms of resolution, which is the ability to focus clearly on these tissues and differentiate tissues from one another." In the future, Friedlaender says this technology can be utilized in a way that is even "more exciting and valuable," using data points to construct 3D printing of parts that need to be reconstructed. In terms of clinical applications, Butler believes that the next five to 10 years will be an exciting time. "Based on our preclinical research, I think a really early application is going to be bone health—joint imaging, someone who has had a knee replacement, or trying to follow up from the fracture that they had," he says. "If someone's broken their scaphoid, can you see that fracture in high resolution? Can you see the bone bruising? You can do that in CT cheaper and faster, and I think that will evolve as probably the first application." But that's just the tip of the iceberg, he says. MARS Bioimaging foresees numerous applications. "We've been publishing a lot of stuff around excised atheroma—atheromas from the carotid artery. These are taken out of people who have had a ministroke or a sudden transient ischemic attack, and we've been studying them both with histology and chemistry and with our MARS scanner, and we know we can measure the fat content on the surface of the plaque," Butler says. "In some conditions, we've been able to see eye and microhemorrhages, so that gives us a new way to understand those carotid plaques and, as we move to being able to do that in living people, it'll give us a new way to understand what's causing the strokes." At present, MARS Bioimaging offers small animal scanners for doing research in this area and is holding a workshop on the scanner in November to attract a network of people around the world doing preclinical spectral CT research. For example, Ryan K. Roeder, PhD, a professor of engineering at the University of Notre Dame in South Bend, Indiana, has been building a library of spectral nanoparticles for cancer diagnosis and research, and a research group at Rensselaer Polytechnic Institute in upstate New York is currently using the system for cardiovascular research. "Ryan has produced nanoparticles that attach to cell lines in breast cancer, and they shot it with different X-ray colors," Butler says. "And here in Christchurch, we've looked at ovarian cancer and breast cancer and lymphomas, so targeted particles that track cell lines that you can see on spectral CT."
In terms of when it's going to be useful for the daily clinician, Butler isn't quite sure, but he's convinced that the day will come. "We're going to start doing research on bone health. We are currently putting people with various bone diseases into our human scanner to study human disease. I think that's immensely practical now, and we're looking for partners who wish to do that with us," he says. "You know, if I weigh my scientific guess, we're just kind of at the beginning of a new theme or branch of research, and that's a really exciting time to get into it." He acknowledges that there is still a long way to go to transfer this technology into the clinic and educate people about its capabilities, but he is confident that it will be useful. "This is the burgeoning of a new field, and I think we passed the inflection point," Butler says. 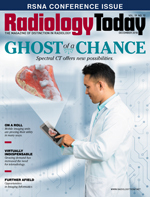 "It's no longer a question of whether spectral CT is going to be useful, or is it going to make it to the clinic. I've reached the point where [I believe] it's definitely going to be in the clinics. It's definitely going to be useful. It's a matter of timeframes and which applications are there first."